I can’t believe this is August 1st – almost 3 months since I’ve written. One of the reasons for that is because no one was coming to this site to watch my bear house build, so I started posting to my regular blog instead. So basically, this has turned out to be just for me. Whatever – guess people just don’t want to be bothered and just don’t care what other people (family, even) are doing. Fine. I don’t care anymore either. So I’ll post pics so I at least have a record of how the build went (terrific!) and how it looks (fantastic). Can’t believe I pulled it off. Finished around July 1st because of company, etc. The finished upstairs chandelier ready to hang. Will collect all the wires and run them onto the roof and into the chimney where the battery and switch is hidden. Had to glue shiplap onto the gabled portion of the roof before I could run the wires. Next pic is testing the system to make sure I don’t cover wires with plaster that don’t work…. We have lift off!! Oh! Surprising how one LED bulb can give off so much light!! I really love the chandelier now. Time to finish the inside of the other side of the roof with wallpaper and wooden beams… Looks nice with the wainscoting. Now to start on the front porch, and hang the front door and the screen door. These doors were no easy feat. They seemed to be sized right, but I had to do a heck of alot of shaving and cutting to them to get them to fit and to open! The hinges took up alot of room despite my trying to inset them. What a pain. Have to think of a solution the next time I make and hang doors! Now starts the lengthy process of finishing the outside wall of the cottage. I hung heavy corrugated cardboard on the front and the right side (facing us) with concrete as a base to strengthen the structure. I did the same procedure around the back opening, as well as stucco finish concrete on the left side with all the windows. What a lot of fussing around, but worth the effort. Then I think I painted 4 layers of white house paint on all sides. I was surprised it took so much paint, but I finally achieved a good solid finish. Then, it was time to finish the porch with columns, brackets, and the custom made roof. I didn’t want just a flat roof, so I designed and made a slanted one and covered it with metal (fake – painted cardboard). Finally, it’s time for the roof. Just sucked it up (fear, that is) and plugged in the glue gun and went for it. Turned out better than I thought, but I spent hours beforehand trying everything I could think of for it to sit as flat and seated correctly as possible. Next was the meticulous task of handpainting every individual roof slate (balsa wood). I mixed several paint colors together gradually to get variegated tiles. Then drew lines on the roof and hot glued each tile by hand. Oh, also made a concrete chimney and used a torn up cardboard egg carton the make the stones. I’m very happy with the way it turned out. All the light wires are run under the roofing into the chimney where the battery and on/off switch are located. Now all that’s left is to hot glue the vines and flowers, and make the flower boxes… Rosebud Cottage is complete!! 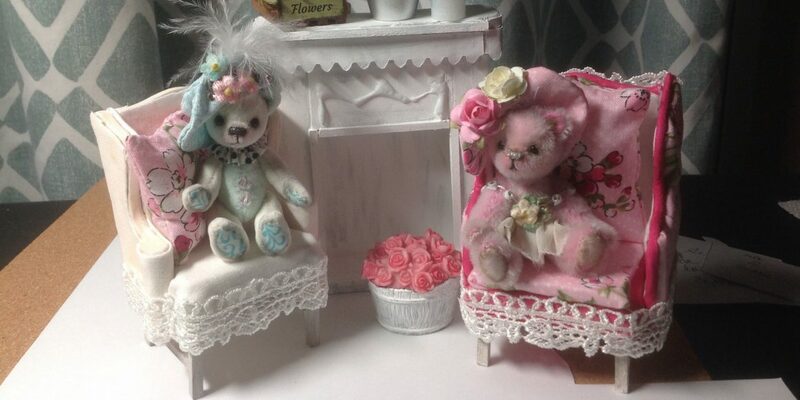 After I’m done making quilled monograms, turtles, and baskets for my Market last days, I’ll start a new cottage – the two bears on the front porch are my new arrivals, Sky and Squeaky, from Australia by Shaz Bears, crafted by Sharon Hale. They are homeless, but not for long! I absolutely love how the Rosebud cottage turned out! I especially love how you designed the 3 windows on the side! You are amazing! I’m so glad i found your blog! Once again, thanks so much, altho Cinderella Moments came up with the 3 window idea. I still love it and although I’m in the finishing stages of a larger dollhouse from Greenleaf ( The Orchid), I’ve found I prefer the smaller cottages. I’ve named my current one Storybook Farm, because I’m going to build a little chicken yard off the kitchen when I’m done shingling the roof. My style has become shabby chic and whimsical. Hope you enjoy your journey. The cottage is absolutely adorable and I am so impressed at the amount of changes and bashing you did for your first miniature house project! Fearlessness in your ideas is what I believe really makes this hobby so much fun! And, most regular folk just can’t see our genius or appreciate what it takes to make tiny things so that’s why it’s even more important to “fan girl” one another via our collective blogs! I’m so happy to have found yours! Thanks for the sweet comments, Jodi. I enjoy whimsical, happy homes and decorating and the bears fit right in with that mindset. I find dolls way too scary unless you get the artisan ones. My current attempt at French Country will not be whimsical, but I love the comfy, cozy feeling it emits. Unfortunately (? ), searching Pinterest for ideas has absolutely flooded my brain. This is definitely a “step up ” for me, but we’ll see how it goes. Thanks for stopping by!